Ted Williams is one of those players that nobody is going to argue about as to whether he's a legend or not. He's one of the greats among the small fraternity of all-time greats. 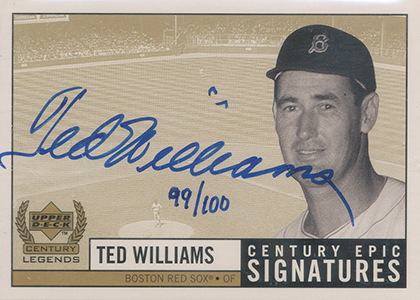 Not surprisingly, Ted Williams cards continue to draw plenty of support with today's collectors. 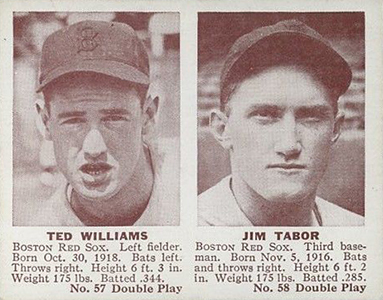 The history of Ted Williams cards is a long one, starting before WWII. Having served during the war, it limited his appearances on things during his prime. Rations also meant fewer cards were produced. In some ways, this makes things murky when it comes to labels and collecting preferences. 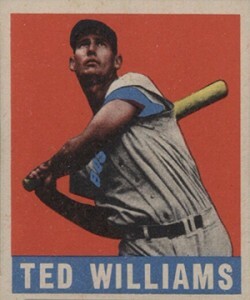 Further complicating things was various deals that meant Ted Williams cards were in some brands but not others. 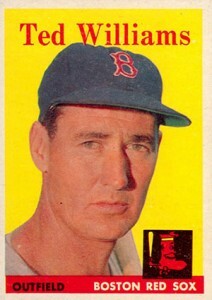 When there were Ted Williams Bowman cards, there weren't any from Topps. Then it flipped. A few years after that, Williams signed an exclusive deal with Fleer that shut Topps out once again. 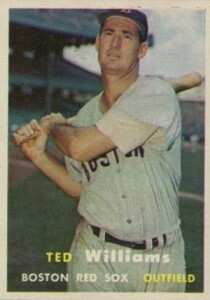 Needless to say, the continuity of Ted Williams cards during his career is non-existent from company to company. 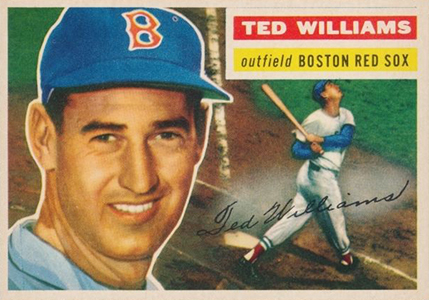 Below we count down 20 of the best Ted Williams cards ever produced. Because it was hard to get it down to 20, we've waffled a little and added a couple of honorable mentions, one of which may or may not be a card depending on how you look at it. Value was a major factor, but not the only one. Appearance and history are also among the things that came into play. Yeah, yeah, yeah -- memorabilia cards don't have the same magic as they used to. However, the popularity of Upper Deck's A Piece of History 500 Club set transcends your average bat and jersey cards. Even without a massive saturation of jersey and bat cards like a lot of players have, collectors can find some reasonably priced pieces of Ted Williams gear cards. This isn't one of them. 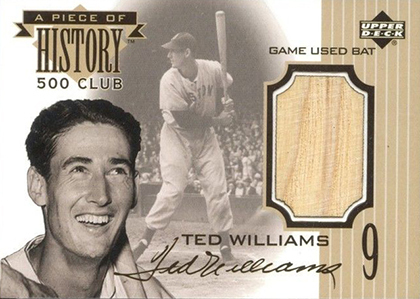 Bolstered by the set's prestige, the Piece of History 500 Club Ted Williams remains one of his most valuable relics. The card was inserted in 1999 Upper Deck Retro. It's debatable as to whether the 1939 Goudey Premium is a card or something closer to a picture. It measures 4 x 6 3/16". Either way, it came out in his rookie year and carries a lot of interest and value. Tough to find, the premium shows Williams with a simple sepia photo. Given the timeframe of its release, the 1939 Goudey Premium Ted Williams could be seen by many as one of his most overlooked vintage releases. Click on the links or images to shop for cards on eBay. 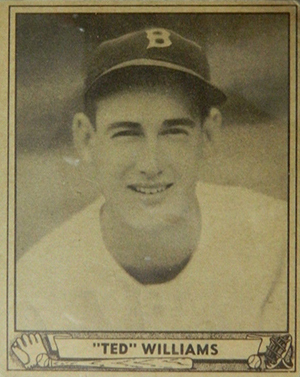 The 1951 Bowman Ted Williams is one of his more affordable vintage cards from his playing days. It has a nice painting of the Splendid Splinter. It's also the exact same one used the previous year. 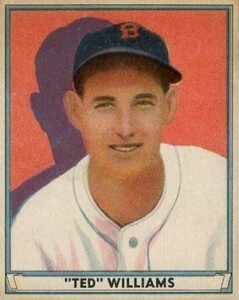 With only slightly different dimensions, it lacks a certain prestige that a lot of other early Ted Williams cards have. Ted Williams followed in the footsteps of Reggie Jackson, Nolan Ryan and Hank Aaron to be the fourth player featured in Upper Deck's multi-year Baseball Heroes program. The basic inserts, which highlighted various achievements, were easy pulls. The autograph, Williams' first in a trading card product, were not. Limited to 2,500 copies, a ridiculously small amount at the time, the signature is done on copies of the checklist card. 1941 Double Play doesn't have the most attractive cards ever. The sepia photos and short captions resemble something you'd expect to see in a yearbook or newspaper article. That said, this is one of the first Ted Williams cards so it carries a certain level of importance and value. Williams actually has two cards in the set. Besides appearing with Jim Tabor, Williams is also paired with Joe Cronin a little further down the checklist. Keeping the horizontal layout of 1955 Topps, not to mention the large painted portrait, the 1956 Topps Ted Williams carries with it some nice eye appeal. Price-wise, it's not cheap but it is usually the most affordable of his vintage Topps cards released while he was still playing. 1955 Topps Double Header is not your typical set. Cards feature one player prominently on the front. A panel on the top then folds down, creating a second player card. They're very similar to the 1911 T201 Mecca Double Folders. Like every player in the set, the illustration of Williams is bright and colorful. It's not the greatest depiction of him, though. Fairly tough to find, a lot of the card's value comes from its rarity. 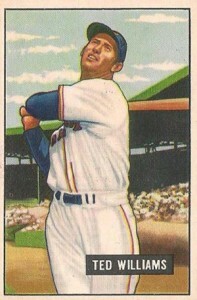 Although this is just the second Ted Williams Topps card, it's one of the least expensive. The card looks good and is still worth plenty but there aren't any outside factors at play that might drive its value up. Think of this as a gimmick-free gem. If you're a Ted Williams fan or collector, the entire 1959 Fleer Ted Williams set is a can't-miss proposition. This particular card makes up a huge portion of the set's value. While it made its way to market through early print runs, it was quickly pulled from the set. That's because Boston's general manager, Bucky Harris, who appears alongside Williams on the card, was under contract with Topps. 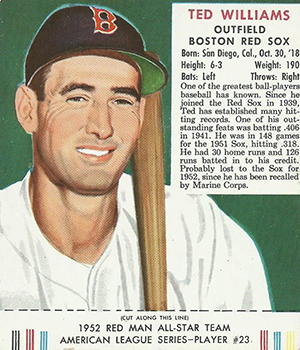 This is the second-to-last Ted Williams Topps card as an active player. So why is it more coveted than some of his older cards? It's a notorious #1. In vintage sets, the first card often got the brunt of the handling from either being on the top of a stack or the weight bearer of a rubber band. Combine that with it being an attractive card of one of the game's true legends and you've got a popular card. Take everything we said about the 1957 Ted Williams card and add the fact that it's his last card from his playing career. That added notoriety gives the 1958 Topps Ted Williams a little more of a bump in value over most of his other early Topps cards. Given its place as one of the earlier Ted Williams cards, the 1948 Leaf Ted Williams should, perhaps, be worth more than it is. While early, it doesn't have the distinction of being among the first Ted Williams cards. And the design isn't the most popular either. Yes, this card isn't cheap, but it could have been so much more. Trying to make up for lost time, 1954 Topps Baseball has Ted Williams as a bookend with the first and last cards on the checklist. These are his first appearances on cards for the company. 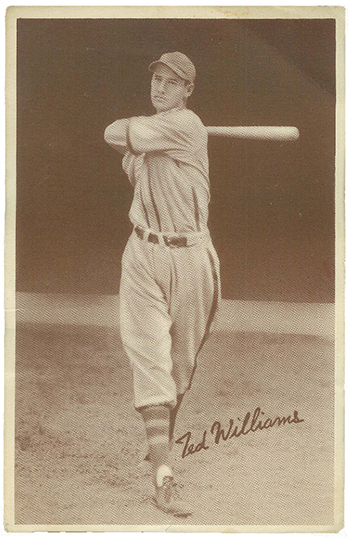 Unlike his later cards that would recycle images, both have two different pictures on the front -- a posed portrait and a black and white shot of Williams swinging. Although neither of of the 1954 Topps Ted Williams cards carries a significant premium over the other in similar condition, the first one is usually a little more valuable. It does kick off the set making it his first Topps card. 1952 Red Man saw baseball cards return to its tobacco roots. Williams is depicted with a sharp painted portrait. The real value of the 1952 Red Man Ted Williams comes from the tab at the bottom. They could be cut off and redeemed for a hat. Obviously, today cards with the tab in tact command a big premium because of their rarity. Cut versions are still desirable, just not nearly as much. 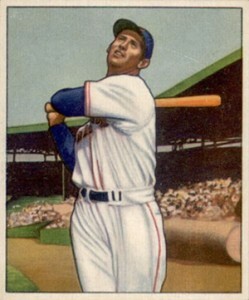 As far as images go, this is far and away better than any of the other Ted Williams cards released before it. The painting may not be the most accurate depiction, but the bursts of color at least give it some life. 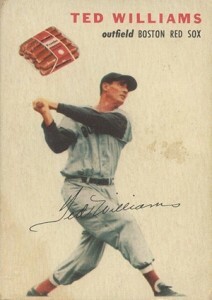 This is the first Ted Williams card under the Bowman banner. Early but not first sums up the appeal of the 1940 Play Ball Ted Williams. Like the 1939 card, there isn't a lot of design to the card outside of the border. Besides the release date, its rarity is its biggest selling point. 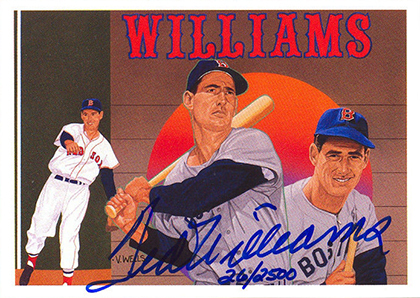 This is one of the final Ted Williams autograph cards to be available in any sort of real quantity. A few were released prior to his death in 2002 but all are extremely rare. Hand-numbered to 100, this isn't a very plentiful card either. In the rare instances that it comes up for sale, it can sell for close to $2,000. Visually, the 1941 Play Ball Ted Williams is so much more appealing than the 1939 and 1940 issues. Sure, the likeness may not be spot-on in the painting, but there's a lot to be said for the color and added design elements on the front. This is one of the most iconic Ted Williams cards ever. 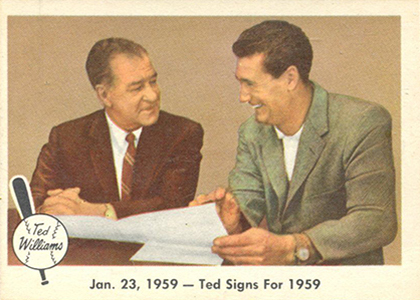 This is another Ted Williams card that was pulled from production, likely because he'd finally signed with Topps. 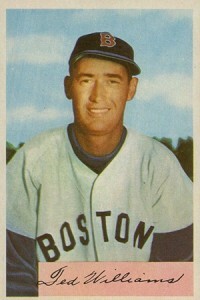 The result is one of the rarest traditional vintage Ted Williams cards. Values have followed suit. It's a beautiful card too with a great portrait of the Red Sox great. Hot dogs and baseball go hand-in-hand. 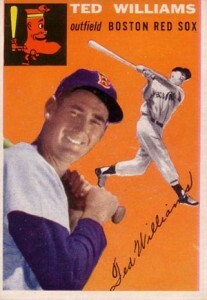 The 1954 Wilson Franks Ted Williams puts the two together with a baseball card spin. The 20-card set was included in packs of wieners. As a result, many soaked up grease and became stained. Finding one of these in any sort of acceptable condition is going to cost a lot. One in top condition will be a small fortune. Aesthetically, the layout has some similarities to the 1954 Topps Baseball set, particularly in the nameplate at the top. With the card landscape a lot different before the War, some will debate what the true Ted Williams rookie card is. 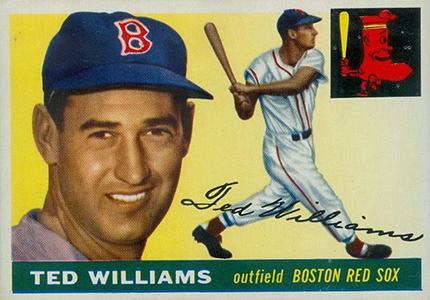 No matter the label, this is the first major Ted Williams card. That gives it a lot more importance than its drab design might otherwise suggest. Further adding to the importance of the set it comes from, it was the first baseball cards issued by Gum Inc, the company that would later become Bowman. 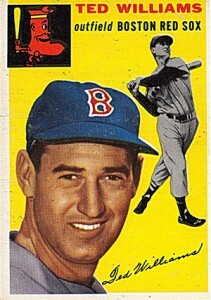 I have a 1954 topps no 1 Ted Williams card. How can I tell if it is a reprint? Great Article! I am a sucker for short prints so the 1954 Bowman is my all-time favorite! The card that should have never been. I found an old clock I bought my dad at a flea market years ago. It’s a clock, a nameplate “Ted Williams” and a plastic cover with screws covering a baseball card. 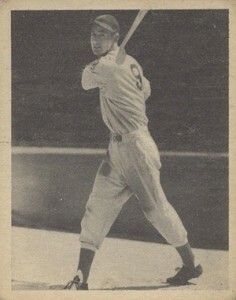 Ted Williams upper deck baseball card. Were these clocks ever made? Is the baseball card worth any money? How about the 500 hit club with the autograph on it. I got one 4/9. I ve never see it on ebay and wonder how much it may cost? 1958 TED WILLIAMS TOPPS #1 SGC 5.5 EX+ CENTERED WITH EXCELLENT COLOR!!! 1957 Topps #1 Ted Williams Boston Red Sox SGC NM 7 NICE! !